Listed here are recollections about Hurricane Hugo on the 27th anniversary of the storm - September 21, 2016. These were provided by those listed below on the Johnsonville SC History Facebook page. Ashley: My Papa, Ray Collins, worked for the power board. So we had lights quickly. I do remember mom and dad cooking all the stuff in our freezer and fridge and feeding linemen and neighbors. Lots of people showered and bathed at our house. I was also 9 years old. Cindy: We spent the night in the hall on the floor. I was on the phone with my Mom in Andrews at 11 and we were disconnected..longest night not knowing if she was ok. We could see our floor "breathe" with the storms. Once morning came, we decided to go to Andrews to check on my family. Bill said we couldn't get through but my response was beyter get the chainsaw, I am going to find my Momma. We met my Mom and Dad between Hemingway and Mingo. They had their chainsaw too! The roads were blocked, some driving on the side of the roads but the relief for all of us to see each other was overwhelming. We followed them back to Andrews. The 30-35 minute drive took an hour and a half. We did indeed feed the lineman. We grilled everything we had. No point in wasting it. Hope to never go through that again! I was in Givhans, SC next to Summerville. We moved to Hemingway after the storm so that we wouldn't miss school (we stayed 3 months in Hemingway) as our homes had been destroyed in Givhans. We lost all personal belongings, thankful we made it out alive as it did so much damage in the low country. I recently traveled back home over the summer and you can still see the effects of this hurricane this many years later. I remember going to school that day being given homework with plans this storm would never hit Sc. I remember my parents taking myself and 3 siblings an putting us in a old block house and covering the windows with anything and everything they could find. Going to sleep and waking up to horrible sounds an my baby sister crying as she was 3 months old. The next morning we awoke to a disaster every tree in the yard was gone or knocked down. My parents home they were working on had 12 trees in it and our mobile home had 10 trees in it. We rebuilt and I remember it taking 3 weeks for them to clear the roads from givhans to Hemingway we always carried a chain saw and chain to drag a tree off the road. My memories as I was only 9 at the time. Former neighbor Lynn Hickman added: You have it correct, Jennifer. as we were next door. Remember every one going to Mr. Thomas's house with chain saws the morning after. He had came home from the hospital the day Hugo hit from having a heart attack. Neighbors wanted to make sure that he had access to his yard in case he had another, We all worked together as we do here in the south, no colors noticed at all! I was in third grade. Mrs. Carol Jordan was my teacher. I remember the day before landfall that we had a talk in class about the hurricane. I actually remember saying something like "could we die?" Mrs. Jordan made me feel a little better but I specifically remember us all looking around at each other and feeling something heavy even at that young age. My Mom always said later that she didn't believe anything was going to happen and wasn't convinced anything was coming. That day was actually really beautiful in the early afternoon. I don't know if we were released from school early or not, but Dad took us to Radio Shack to pick up some supplies. That night, my brother Zach and I went to sleep in our parents' bedroom. I was sleeping and woke up as my dad picked me up in the air and ran out of the room with me. A tree had hit our roof on the end of the house we were sleeping in. He moved me, Zach, and mom into the bedroom we shared, which had two sturdy iron framed twin beds. The beds were high off the ground, so they pulled one away from the wall and we slept under the bed for extra protection. The next morning, when we woke up, there was one tree laying across our roof. We had two tall pines in the front yard, and the top 3rd of one of them had snapped off and was sticking out of our front yard like a lawn dart. If that tree had come over just a few yards further, it would have come straight through our roof. We drove downtown at some point later - I just remember windows being blown out of stores, and lots of the phone and power poles leaning in the same direction. In my mind it looked like those photos you see of a nuclear test where everything is leaning the same way afterwards. My grandparents were out of town on a trip - they weren't even really aware what had happened or how bad it was. They had a gas hot water heater, so we were able to take warm showers over there. My Aunt Faye Hanna had lots (and LOTS) of frozen veggies, and I remember eating beans and beans and more beans cooked on the grill as the freezers started to thaw. I also remember after everyone had power again and things had become a little more normal, WBTW aired this PSA that said "Hurricane Hugo is gone now but many of our neighbors are still in need..."
The thing I remember most is hearing the trees fall. We had 60 pine trees in the back that fell. The 2 bigger trees was a china berry in the front and an oak tree on the side of the house. It seemed like they shook the earth when they fell. Going without power and water for 3 weeks was no picnic either. Also the sound of chain saws the next morning when the sun came out, every where. I still hate the sound of them! We couldn't get down the roads, but thankfully we had help that came to the fire department and dispersed water and canned foods. A life saver for many! Caroline: I remember driving across town before the storm got really bad to make sure everyone on the hill (Newell Rd) was secure and then going home to ride it out on mattresses on the living room floor. I slept through the worst of it like nothing happened. After the storm, the neighborhood family with a generator would make coffee in the mornings for all who needed it and the neighbors took turns cooking everything in their freezers and feeding the neighborhood before the food started spoiling. My family on the hill lost water and power so they would come to our house and shower in our freezing cold water by candlelight bc we still had no power. I was young and while I remember the devastation and clean up, what always stuck with me was how my neighbors and family all took care of each other. Liz: I remember after the storm we drove to Hemingway one night because there was an 18-wheeler LOADED with ice and they were handing out bags to everyone. Wonder where all that ice came from? Does Red Cross do ice? Or FEMA? It's a mystery to me! Caroline: Wow I don't remember that at all! I do remember making some sweet forts off the roots of overturned trees though! I live in Greenville but had lots of family near coast. On Friday morning in my new car I hauled a generator and gasoline to meet my brother on 378 so they could keep freezers going. My sis had most damage in Georgetown. My husband, Dean & I were living in Cedar Swamp, a small community about 12 miles out of Kingstree, South Carolina. We were about 64 miles or so from Myrtle Beach, S.C & about 80 miles from Charleston, S.C..
We were in the process of moving out of our mobile home and into a house. We had one son (six yrs. old) and one daughter (4 months old) and I was about 3 months pregnant, but didn’t realize it at the time. We went to his parents for the night as they lived in a brick home. We slept on the floor of the living room, not that any of us got much sleep. I remember telling my husband that I love him so much, having my 6 yr. old beside me for a time(at that age even a hurricane can’t keep them still) and holding my 4 month old as if it would be my last time holding and loving her. The winds were howling. Trees were blowing back and forth. It was the most eerie feeling I’d ever had at the time and certainly the first hurricane I had witnessed. We went outside when the eye was over us. The entire experience was an eerie feeling indeed. You never forget the winds, the limbs snapping like pencils, noises of the unknown or the fear in your heart for your children, family, property, belongings. We were blessed not to have lost any family or personal, sentimental belongings. The next morning we saw the mobile home that we were almost moved out of was overturned by, what we guessed was a tornado during the night. It picked it up, turned it over and set it back down in the exact spot it was in before. The home we were moving into had fairly minimal damage. The damage around was unreal; unlike anything I had seen. We were out of power for a few weeks. We gathered our resources and either wood and gas grilled what we could from the freezers before losing much of it. As many others in the community, we lost meat, vegetables, all of what we had put up during the harvest season. One neighbor had a spring and allowed the community to get what water they needed, as needed. It’s amazing how you can bathe with a mere one gallon of water. It’s heart felt the way communities come together to help in any way they can, the ones that had no damage as well as the ones that did. During and afterwards was a time for thanking God for keeping us safe and sparing us from what could have been so much worse. Some people may not remember where they were on the night of September 21st , 1989 and through the next 48 hours.. I still remember . 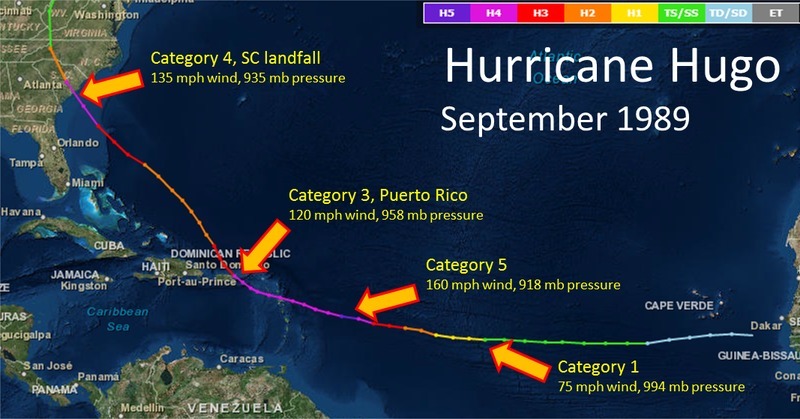 Hurricane Hugo made landfall right after midnight on Sept 22nd as a Category 4 Hurricane. I was a very young ED nurse at a small community hospital in Lake City,SC. I left work earlier in the day , headed home and packed a bag, took Chase Stone to grandma Sha's and headed back to work. I remember the winds howling and the last patient Florence County EMS was able to transport out before the ambulances stopped running. Standing on the ED dock and seeing the roof of the tobacco warehouse fly off and pieces hitting the first new car I ever owned. I remember volunteers from Johnsonville Rescue Squad bringing the first patient in after the storm...cutting through and clearing the road as they drove . No water, no power. Hospital running on generators and water buffalos brought in by the National Guard. Exhausted from hours of being awake and finally catching a quick nap on a stretcher in the hallway of our Radiology dept. Two things I remember most. Laying under a table with my momma in our little house in Marion and asking her if she heard that train coming by. And she said the trains quit running hours ago. We proceeded to pray a little harder. Lol. And the other thing I remember is my PaPa (Reginald Baxley Sr.) going to bed at his regular time and snoring the whole way through the storm in Johsnonville. He never woke up once. Guess he figured Jesus was in the bottom of the boat sleeping in the storm, so could he! I originally was scheduled off from my night shift position in a Florence nursing home. But I was asked to come in because both night shift nurses scheduled called in. So I left my three year old daughter with her daddy who was going to spend the night with his parents. That night, as winds intensified, the phones and power went out and stayed out, and after an hour the emergency lights did too. When the storm roared over Florence, it ripped the roof off one wing of our building, and the two nurses and four techs moved the thirty two elderly and infirm in the dark and pouring rain to the other side of the building in the dark as best we could. We spent the remainder of that night keeping the flooded water and debris at bay, cared for eighty eight terrified souls, and worrying ourselves sick over the unknown plight of our own families. At daylight, as we waited on staff to come in, we cried at the damage we could see outside and around. By nine, we realized no one was probably going to be able to get to us (no phones) so we went to the kitchen, found what we could to feed our residents that didn't need to be cooked, and spent the remainder of the morning working hard to make sure our "babies" were okay. We were bone-weary when help finally arrived, and I still had a forty five minute ride home. But I had never been more proud of my staff or my profession. As I drove home, passing property destroyed beyond recognition, and having to turn around and find a different route due to downed trees and power lines, I sobbed uncontrollably over the unknown fate of my own family and property. A forty five minute ride turned into a four hour ordeal as I finally came out of a side road to see highway 378. I was just south of Sumter. When I drove up to our little home behind my in-laws, I was so relieved to find my family unharmed and my home spared. Although we were surrounded on three sides by trees, all ten of them that fell formed a "teepee"-like structure over our house, each one falling in just a way to form a brace for the others to lean on. I sat in my car and literally could not speak or move from a combination of exhaustion, relief, and gratitude mixed with immense grief over the carnage I'd seen on my ride home. I'll never forget that night. I was in 11th grade. I think I remember school being cancelled that whole day before Hugo hit and maybe even getting out early the day before. My mother had had surgery earlier that week in Conway and was supposed to be released that Thursday, but the doctor decided she would be better off staying there another night. My brother was off at Clemson, so that left me and Daddy to get ready for the storm. I did what little I knew to do inside, like filling the tub with water and any water jugs I could find, but it was nowhere near enough. Daddy and I spent the night in the hall, and when that first big pine fell and hit the house, I cussed in front of my daddy for the very first time. He didn't get to mad, needless to say. The awful howling of the wind was one thing, but those bone-jarring thuds as the pines hit the earth are what I really remember. After that tree hit and the rain started coming in through the roof in my brother's room, we spent the rest of the night emptying coolers and trash cans of water into the tub. The next morning, our first thought was finding out how Mama was in Conway, but we couldn't get through to the hospital. The next step was trying to make it over to Daddy's parents to check on them. We couldn't get out of the driveway for the trees- we snaked our way out in Daddy's Jeep through the woods. After checking in with my grandparents, since we still couldn't reach the hospital by phone, we decided to just drive to Conway to go see for ourselves. I can honestly say that the further we got from Indiantown and Johnsonville, the better things looked. Who knows- maybe we had more tornado damage than they did up that way. Poor Mama- having to come home from the hospital to recuperate from surgery in a house with no power, no running water, a hole in the roof, no way to cook, and no AC- not even a fan to stir a breeze. After one night like that, Mama and I moved to town to stay with my aunt Elaine and Uncle Charles since they at least had running water. That was an adventure for me- seeing what it was like to live in a neighborhood instead of the country! The other week when the tropical storm came through and I saw the big pine tops swirling around above our house, I couldn't even imagine what it must have looked like the night of Hugo. I am glad that storm hit at night, because as scared as I was, at least I couldn't see how bad it was.